The National Savings Card Fundraising Program is a unique idea for schools to raise funds. These cute little key tags include discounts to local and national businesses. Supporters will love the savings they receive on each card. Your school or group will earn 50% profit, which is considered high. You can order as few as 5 cards and still receive free shipping. Make it easy on yourself and take advantage of ordering online. We recommend ordering 1 National Savings Card per fundraising participant. 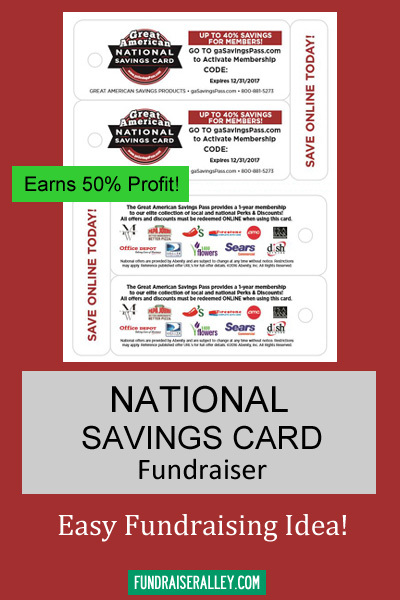 Buy National Savings Cards for $10 each and sell for $20 each and earn a quick 50% profit for your group. Simple and Easy! You will receive free shipping with a minimum order of 5 cards. You will receive cards in about 10 business days. 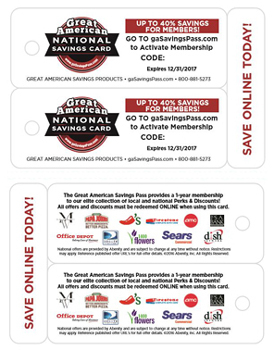 Everyone is looking to save money, which makes these discount cards a great fundraising opportunity for your school or group. Each little card give lots of discounts and your group will earn 50% profit for every card sold. It’s a win, win.